Marie Elmina Aurelie St. Amand (nee Paulhus) was called to join her son, parents and brothers. 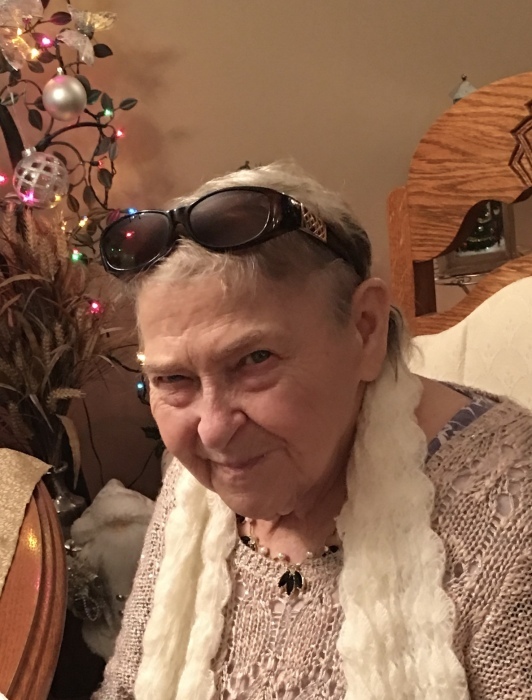 Elmina passed away peacefully in her sleep at Herb Bassett Home in Prince Albert, Saskatchewan on Tuesday, April 2, 2019 at the age of 81 years. She was born in Batoche, Saskatchewan on December 5, 1937, to Alice (nee Boyer) and Fred Paulhus. Elmina grew up in Batoche and spent a lot of time with her grandmother and family. In her teen years, she moved to Prince Albert to attend PACI. Elmina married Henry St. Amand in 1958 and together they welcomed seven children. They lived in Prince Albert at 1138 15th Street West for the winters and at 4 on 4th street at Sunnyside (Emma Lake) for the summers. Elmina worked various jobs; including running the trampolines, Holy Family Hospital, Ed's Chicken Inn and catering for Mme Boucher. She took great pride in being a mother, grandmother, great grandmother, daughter, sister, and friend. Elmina will be sadly missed by her family, friends, and anyone she met along the way. She is survived by: her oldest son: Richard St. Amand and his children: Celeste, Justin, Chantel and Lisa; her oldest daughter: Denise (Mike Leopkey) St. Amand; her favorite son: Denis (Debbie) St. Amand and their children: Breanne and Drayton; her daughter: Pauline (Wayne) Boden and their daughters: Beauvon, Kandace, and Daidre; her youngest son: Marcel (Gloria) St. Amand and their sons: Jaedin and Brendin; her daughter: Darcy (Horace) Ratt and their children: Annakah, Thomas and Crosby; her youngest daughter: Shauna (Frank Everest) St. Amand and their sons: Chucky and Robby; her grandchildren: Rebecca and Skyler; her brother: Henri; her sisters: Edwidge and Aurelie; as well as her great-grandchildren, many nieces and nephews, extended family and close friends. Elmina was predeceased by her parents; her brothers: Andre, Elie, Julien, Raphael, Philippe, Clement, Marcien, and Fernand; the father of her children: Henry; her son: Robert; and her three great-grandchildren: Kaidynce, Kaiden, and Ava. Elmina had a way with words and was not afraid to speak her mind. She was able to win your heart and push your buttons at the same time. She will be remembered for her open arms, fresh baking and her unique personality that made everyone she met laugh and cry. She was always the life of the party and will continue her party with a Celebration of Life on Saturday, April 6, 2019 at 2:00 pm at Midtown Hall, 540 – 9 Street East, Prince Albert, Saskatchewan, with Margaret Ferchuk as Celebrant. Family and friends wishing to send online condolences are invited to visit www.beaulacfuneralhome.com Funeral arrangements have been entrusted to Beau "Lac" Funeral Home, Prince Albert, Marianne Turcotte, Tracy-Lynn Lenchuk, Funeral Directors (306-763-3322).